This Crazy Chameleons team has gone off the deep end and entered into the Worldwide Surf Tournament of Ultimate Bodacity. Click here to play! It's the premiere lizard surf event in the world, but a chameleon has never won it before. Lizards think that chameleons just aren't bodacious enough to be competitive in a surfing contest, but the Crazy Chameleons intend to prove the critics wrong. You can help the Crazy Chameleons prove they are just as good surfers as the Komodo Dragons or the Sensational Skinks by playing the Crazy Chameleons slots. By lining up Green Chameleon symbols or Wild Surfboards, you can win big prizes for yourself while supporting these scaly surfers in their quest to prove that chameleons have surfing chops. 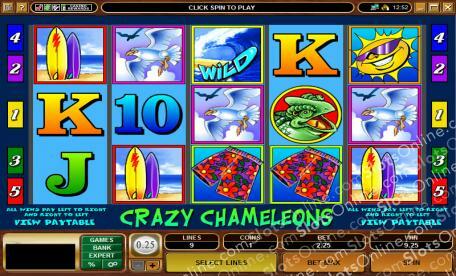 Forget the beach, go to the casino and help the Crazy Chameleons catch a wave or two. The Wild Surfboard symbol substitutes for all other symbols in the Crazy Chameleon slots.